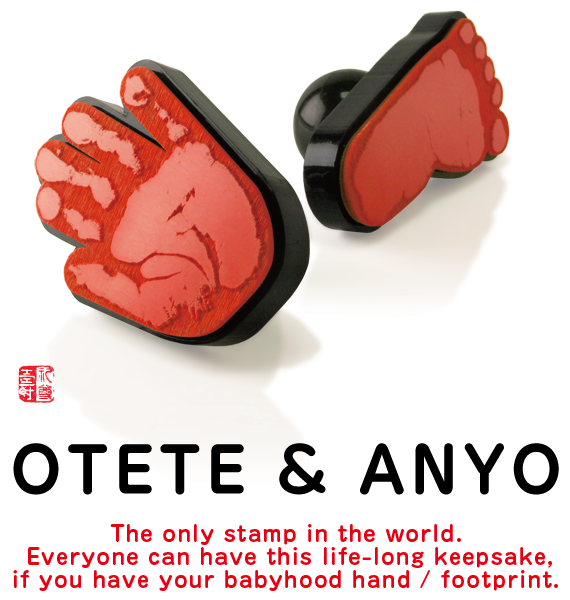 The word "OTETE & ANYO" are lovely nickname for baby's "HAND & FOOT" in Japanese language.They are only original stamps in the world that engraved baby's tiny handprint or footprint in real size.Not only using a simple stamp that can be stamped on papers and letters, but also they can be used for lifelong memorial such as birthday present, baby gift and more. Baby's tiny hand & foot are very rare existences that can be felt in only a moment in his / her life. "OTETE & ANYO" is an original product of Rezon that celebrates beginning of the rest of baby's life as a lifelong memorial. © Kawamura Hideo Activity Inc. All rights reserved.